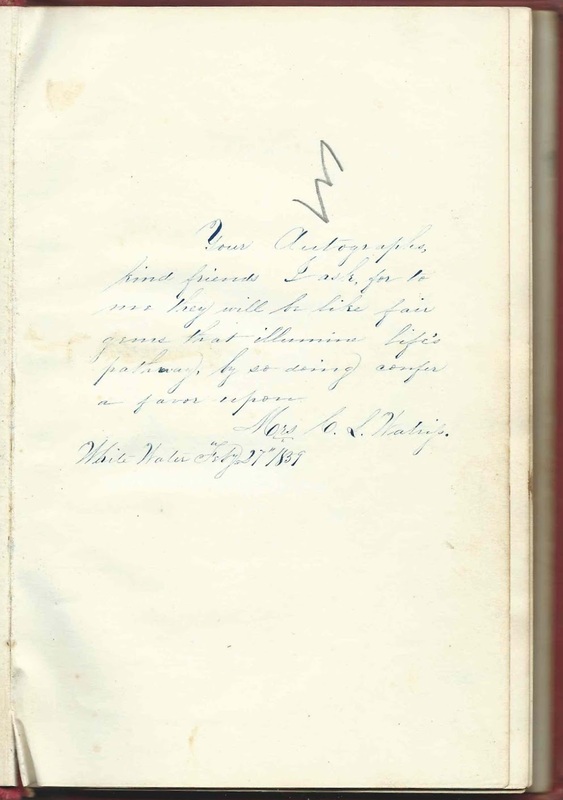 1859-1897 autograph album of Calista L. (Hiland) Watriss of Hartland, Vermont, with many sentiments gathered while she was visiting, or perhaps living briefly, at Whitewater, Wisconsin. The Watriss surname has variants of Watrous, Watress and Waterhouse, among others. 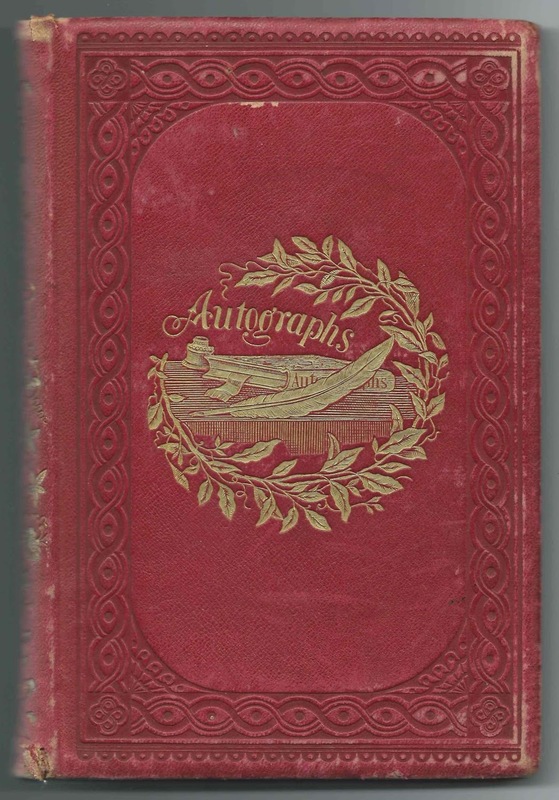 Most autographs date to 1859 and the 1860s, but there is at least one later one, the autograph of Calista's granddaughter Blanche Watriss Leonard of Hartland, Vermont, signed in 1897. Blanche was born on December 25, 1886, the daughter of George Sylvester Leonard and Hattie Calista (Watriss) Leonard. Sadly, Blanche's parents had died by 1897, her mother in 1889 and her father in 1891. 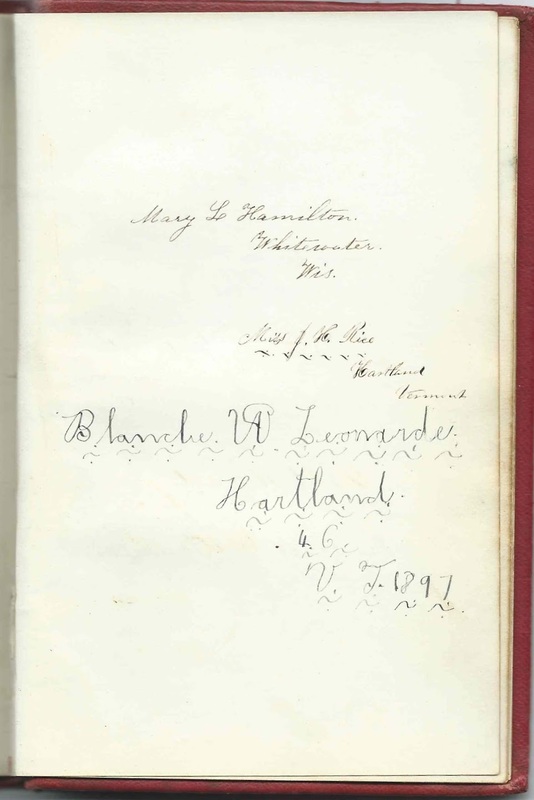 Blanche signed her name on a page with the inscriptions of Mary L. Hamilton of Whitewater, Wisconsin, and Miss J. L. Rice of Hartland, Vermont. They may have signed the page years earlier than Blanche, and there may or may not have been a relationship between them and Blanche. The album measures approximately 7-3/4" x 5-1/2" and contains the sentiments and autographs of 217 people, most of whom wrote their names on pages shared with others, whole families in a few cases. As noted above, many of the autographs were collected at Whitewater, Wisconsin, in 1859 and 1860; many more were signed by folks living at Hartland, Vermont. Perhaps Whitewater was a popular destination for settlers from the Hartland area. An alphabetical surname list and an alphabetical list of the signers, together with any personal and family information they may have offered, appear at the end of this post. Many signers were Calista's family members and in-laws. Calista L. Hyland was born in February 20, 1826 at Hartland, Vermont, the daughter of James Hiland and Lavina (Frost) Hiland, who were born in Massachusetts and Maine, respectively. The Hiland surname appears variously as Hyland and Highland. I'd like to know Lavina (Frost) Hiland's place of birth in Maine and the names of her parents. On September 6, 1841 at Hartland, Vermont, Calista married Henry B. Watriss, son of Charles Frederick Watriss and Hannah (McCollester) Watriss. Calista and Henry had a son Albert, who died in 1849. I don't know if they had other children before daughter Hattie Calista Watress in 1862, mother of Blanche, noted above, but there are no other children buried with them at the Hartland Village Cemetery, according to a list posted online by the Hartland Historical Society [kudos to them for a well-done website]. Whether the trip to Whitewater, Wisconsin, was a planned move that didn't work out or just a visit, I don't know, but she and Henry were back at Hartland, Vermont by the time of Harriet Calista Watriss' birth on November 9, 1862. I haven't yet found them in the 1860 Census, so perhaps they were in between places at that time. There are autographs from Whitewater, Wisconsin, up to March 13, 1860, but many are undated, so there could have been later ones. Henry B. Watrous died in 1898. The 1910 Census of Hartland, Vermont, shows Calista living in the household of her granddaughter Blanche Watriss (Leonard) Bagley, her husband Harry A. Bagley and their two children. Calista died in 1912 and is buried with her husband, son Albert and daughter Hattie Calista (Watriss) Leonard at Hartland Village Cemetery, Hartland, Vermont. Below, Calista's cousin Ira Hiland of Boston, Massachusetts, his wife Martha (Manson) Hiland and their daughter Sarah M. Hiland shared a page. Refer to the list of signers for the names of more relatives and in-laws. Two of Henry B. Watriss' brothers signed pages in the album: Norman E. Watriss and Luke Willard Watriss. Refer to the list of signers for more members with a connection to the Watriss and Hiland families. List of signers [Note: Given names within a specific surname may not be in alphabetical order. Caroline A. Bullock, signed at Whitewater, Wisconsin, on March 5, 1859; presumably Caroline A. (Rowe) Bullock, wife of Daniel Bullock, Supt. of Northwestern Manufacturing Company. http://books.google.com/books?id=uWpBAQAAMAAJ&pg=PA688&lpg=PA688&dq=%22Daniel+Bullock%22+Whitewater+Wisconsin+Caroline&source=bl&ots=9uM2MEb3iE&sig=zSA0Qh1fgYTadihWcJpKNAU66mk&hl=en&sa=X&ei=sXcLVKehOamSsQSnhoLACQ&ved=0CCAQ6AEwAA#v=onepage&q=daniel%20bullock&f=false Caroline was the daughter of Ira Rowe of Connecticut. Cousin Mary Ann Chase of Hopkinton, New Hampshire. She was Mary Ann (Dodge) Chase, daughter of Stillman and Sarah (Highland/Hiland/Hyland), so related to Calista through the Hiland line. Solomon Clark, born about 1823 in New York. Shared the page with Mrs. Clarissa Ferris; Miss Emma H. Clark; Miss Carrie D. Clark; and Mrs. Sylvia Clark. John Colby of Hartland, Vermont; presumably the attorney John Colby, born September 19, 1807. Shared the page with wife Adiline Minerva (Kneeland) Colby. Mrs. M. H. Emmons of Hartland, Vermont. She was Malinda (Hendrick) Emmons, wife of Lewis Emmons, who shared the page. E. B. Harding of Hartland, Vermont; not sure of first initial; possibly Edward B. Harding, son of John and Lucy (Willard) Harding. Shared the page with Martha Harding; Henry Harding; and Marcia E. Furber. Mrs. Lavinia Hayes of Palmyra,Wisconsin; Lavinia Thomas (Thompson) Hayes, born at Hartland, Vermont; wife of Henry W. Hayes, with whom she shared the page. Philip Hemenway, "Aged 87"; shared the page with wife Eunice (Stone) Hemenway. They must have inscribed this page about 1863. Philip died on August 29 of that year, and Eunice died the next year. They were Massachusetts natives. Eunice Hemenway, "Aged 79", of Whitewater, Wisconsin. She was Eunice (Stone) Hemenway, wife of Philip Hemenway, with whom she shared the page. They must have inscribed this page about 1863. Philip died on August 29 of that year, and Eunice died the next year. They were Massachusetts natives. 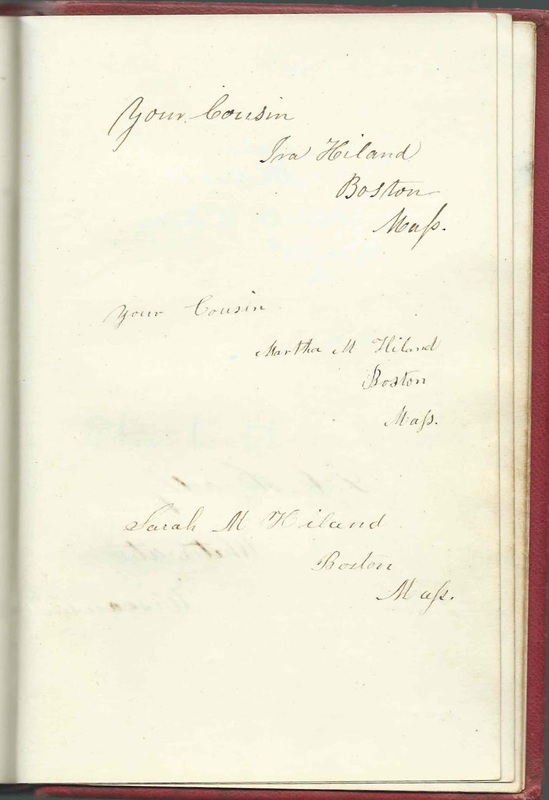 Sarah M. Hiland of Boston, Massachusetts; shared the page with her parents Ira Hiland and Martha M. (Manson) Hiland. Mrs. Mary Ann Hodgman of Hartland, Vermont, signed on March 25, 1863 Another daughter of William Henry H. Walker and Rachel (Stevens) Walker; Mary married Franklin Hodgman. William Hunter of Whitewater, Wisconsin; shared the page with his wife Mrs. Sarah (Potter) Hunter. Mrs. Sarah P. Hunter of Whitewater, Wisconsin, signed on March 14, 1860. Shared the page with her husband William Hunter. According to contemporary writing on the facing page, she was Sarah (Potter) Hunter. William was born in New York about 1823 and Sarah in New York about 1830. They had 3 children born in Wisconsin: Calvin, Garland and Mary. Timothy Kimball of Claremont, New Hampshire; middle initial possibly D., for Timothy Dakin Kimball. Shared page with Caroline M. Kimball. Contemporary note: "6500-2500. Timothy, Retired Mechanic, Born 1810. W.I. Goods Dlr. 3,000-3,000. Caroline 1874"
Caroline M. Kimball of Claremont, New Hampshire; shared the page with Timothy D. Kimball. Contemporary note: "6500-2500. Timothy, Retired Mechanic, Born 1810. W.I. Goods Dlr. 3,000-3,000. Caroline 1874"
A. F. Knox of Whitewater, Wisconsin; shared the page with Mrs. Celestia A. Knox. Contemporary note: "1860 Census, A.F. B 1819, Farmer 600/2000 + Celestia B 1821, No War"
Mrs. Celestia A. Knox of Whitewater, Wisconsin; shared the page with A. F. Knox. Contemporary note: "1860 Census, A.F. B 1819, Farmer 600/2000 + Celestia B 1821, No War"
Mrs. M. L. S. Marcy of Hartland, Vermont. She was Mary Lydia (Smith) Marcy, wife of Ithemar Marcy, who shared the page. M. Addie Marcy of Hartland, Vermont; Mary Adelaide Marcy, daughter of signers Ithamar and Mary Lydia (Smith) Marcy. Shared the page with Julietta J. Marcy and Alice I. Marcy. S. H. McCollister; shared the page with Nettie Roberts. Contemporary note: "Author". Presumably Sullivan Holman McCollester, born December 18, 1826, son of Silas and Achsah (Holman) McCollester. Educator, pastor, author. S. M. Perkins of Winchester, New Hampshire; Sarah Maria (Clinton) Perkins, wife of Rev. Orren Perkins. Shared the page with D. A. Russell and husband Orren Perkins. Mrs. A. A. Smith of West Randolph, Vermont; shared the page with Mrs. Eva Cutler and May A. Sherman. Mrs. Jane M. Starin; Jane Maria (Groat) Starin. Shared the page with husband Frederick Jacob Starin and daughter Margaret Frances Starin. Maggie F. Starin; Margaret Frances Starin. Shared the page with her parents Frederick Jacob Starin and Jane Maria (Groat) Starin. Mrs. ? P. Trippe of Whitewater, Wisconsin; presumably Daniel Comstock Trippe's wife Florence (Pratt) Trippe, with whom she shared the page. Mrs. C. L. Watriss, signed at White Water, Wisconsin, on February 27, 1859. Album owner. Possibly Mrs. Calista L. (Hyland) Watriss, wife of Henry B. Watriss of Hartland, Vermont. L. E. L. Watriss, signed on September 14, 1870; Lucia E. (Lull) Watriss, wife of Luke Willard Watriss, with whom she shared the page. "Your sister" and "Also Emma". Presumably Lizzie L. (?) Watriss, wife of Norman E. Watriss. Emma was their daughter, born in 1855. Shared the page with Adelia Whittaker and Norman E. Watriss. Norman E. Watriss of Hartford, Connecticut; shared the page with Adelia L. Whittaker and his wife Lizzie L. (?) Watriss. He was a brother of Henry B. Watriss, husband of album owner Calista L. (Hiland) Watriss. Shared the page with Adelia L. Whittaker and his wife Lizzie L. Watriss.